It’s there for the taking – real-time information about every physical operation of a business. All you need is a key: data analytics. 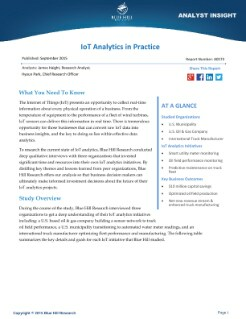 This paper is based on Blue Hill Research’s interviews of three organizations – a US-based oil and gas company, a US municipality and an international truck manufacturer – each of which heavily invested in IoT analytics. Focusing on the key themes and lessons learned from their initiatives, this paper will help business decision makers make informed investment decisions about the future of their own IoT analytics projects.